A Mandari mother wearing a floral European dress holds a breast-feeding child on her hip, with other women looking on from the group behind. Morton, Chris. 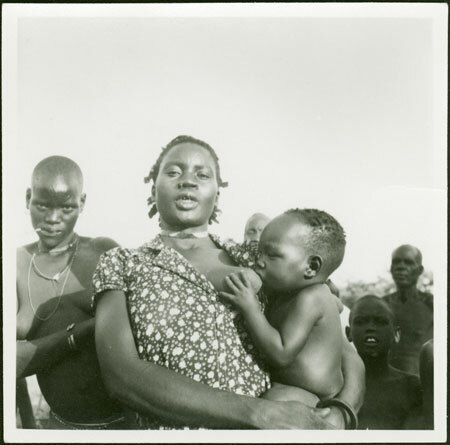 "Mandari mother and child" Southern Sudan Project (in development). 03 Jan. 2006. Pitt Rivers Museum. <http://southernsudan.prm.ox.ac.uk/details/1998.97.216.2/>.